1. Kelley Field - Bath Rec. will contact the President of the league by 7:15AM if the field is closed - (by 2:00PM for weekday games). President will contact the managers. Managers will contact their team. 2. Edwards Field - Brunswick Rec. will contact the Scheduler. Scheduler will contact President, President will contact managers, managers will contact their team. 3. The home team is responsible for contacting the umpire to let him know a scheduled game has been canceled. Umpire contact information can be acquired by accessing the Arbiter website. 4. 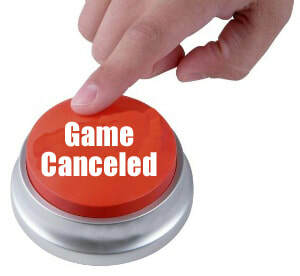 If you want to cancel a game or move it to a different day you are welcome to do so. Contact the manager of the opposing team and settle on a mutually agreed upon time. Home team gets final word. If you cancel.....see items #3 & #5. 5. If managers decide to cancel a game, you not only have to notify the umpire, but you also need to notify the Scheduler and league President. The Scheduler will contact the grounds crew and the President will notify the website coordinator to make them aware of the canceled game. 6. Rescheduling a game is the responsibility of the two managers of a canceled game. Managers will agree on a day and time and coordinate with the Scheduler so the game can be rescheduled ASAP. The Scheduler will insure the field is available and an umpire is assigned. 7. The President’s primary role in this process is to contact the managers and website coordinator if the Bath Rec. Department closes the field. It is the manager’s responsibility to make sure their team, the umpire and the Scheduler are aware of the situation. 8. Field Tarp - It is the responsibility of the home team to cover the mound and home plate area after a game. The only exception is if there is a game being played after your game. In that case there is no need to use the tarps unless the weather looks threatening. NO METAL CLEATS when standing on the tarps please.